Last Fall we both made a conscience effort to change our up beauty routines. We chatted a little bit about our Fall and Winter skincare routines, but we mean beyond that. 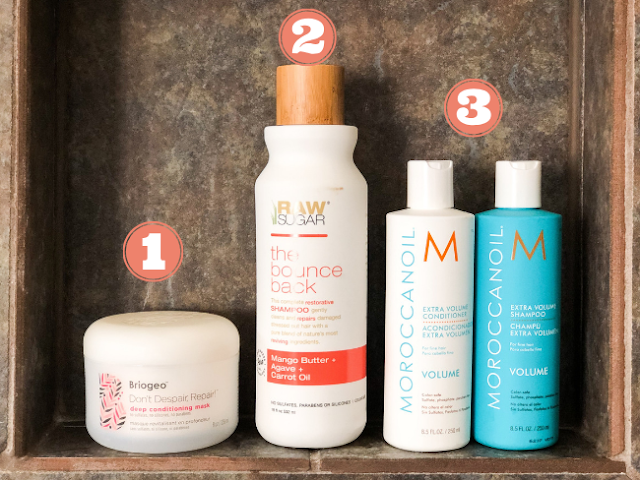 We've strived over the last few months to have a better beauty routine. One that is cleaner and will serve us in the long anti-aging haul. As we've gotten older we've tried to really pay attention to what our skin needs, and what products serve us best. We realize we aren't getting any younger. We aren't trying to turn back time and look 22 again (um, how awesome would that be?! ), but we are trying to maintain a youthful glow and take care of our skin much better than we maybe did ten years ago. After doing some research we both made the leap to switch to cleaner beauty products. We couldn't believe some of the facts we found. The fragrance industry isn't regulated at all. Because of trade secret laws they do not have to disclose the ingredients they use. 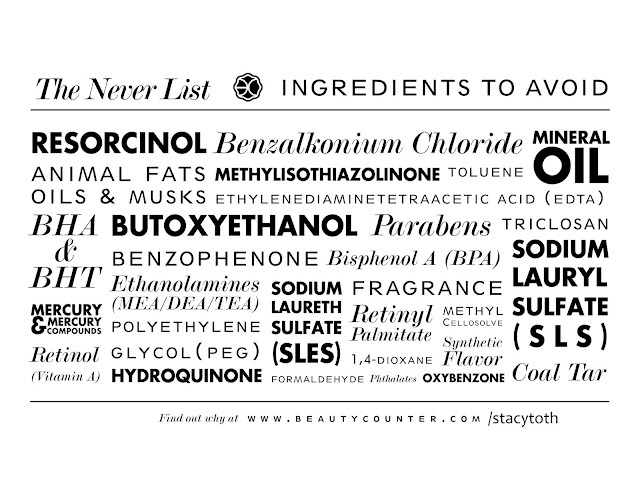 The European Union has banned over 1,300 ingredients used in cosmetics. The United States - 30. Our skin is our largest organ. We want to protect it! And maintain that whole youthful glow we've been chatting about. It takes only 30 seconds for something to absorb into your skin and enter your bloodstream. Thinking about it that way, we want to use the safest ingredients possible. We thought...Why not use beauty products that are proven to be good for you rather than ones that might or might not be harmful? Even though there are some beauty products we've used for years, have trust in, and hate to break up with - we know at least trying to find an alternative is better for our health and well being in the long run. Transitioning to cleaner beauty products has taken some time. There has been lots of trial and error, and even after extensive testing on our parts, some items we are still on the hunt for. The majority of our favorite better beauty products come from Beautycounter. We've always tried to steer clear of MLMs and not listen to the hype of certain brands. But Beautycounter is the real deal. Beautycounter is constantly in the news for advocating for a change to the beauty product industry (Go ahead and Google. We'll wait...). But aside from leading the way (and slaying while they do so because hello amazing lipglosses), they produce a seriously amazing product. 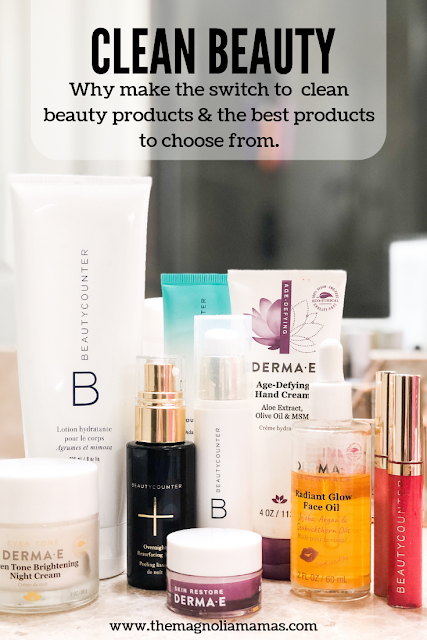 Some of their products are now our favorites in both skincare and beauty, and we can't imagine not ever having them in our routines. 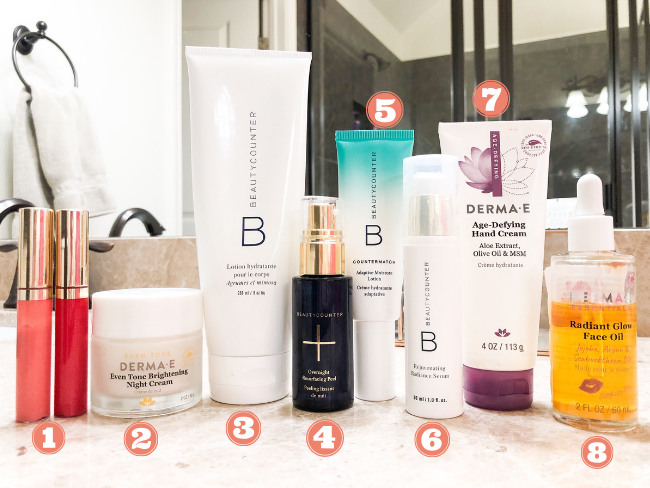 Aside from Beautycounter, some of our other favorite brands are DermaE, Coola, and Goop. Here's a breakdown of both of our favorite clean beauty products. 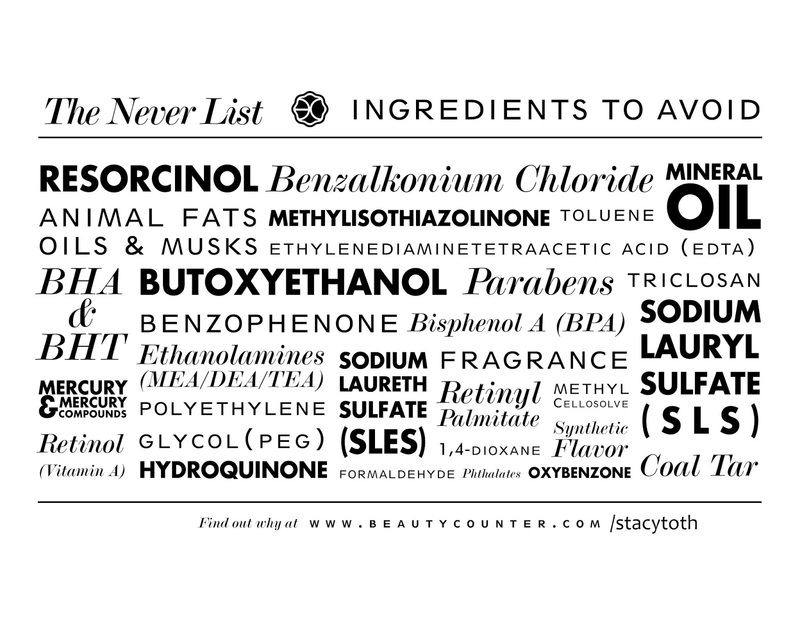 I am certainly no clean beauty expert, but I do have some products that I use on a daily or weekly basis and just love. I've been using most of theses for at least a year now and some for even longer. I've tried some other products that I didn't love as much so only sharing my very, very favorites! 1. Beautycounter Facial Oil - I love this stuff! I started using it after Jen told me how much she loved her oil. I use it each night and it just feel like it makes my skin feel so soft. 2. Dearma-e Overnight Peel - I try to use this once a week and should probably do it at least twice a week, but I always forget! 3. Beautycounter Stick Sunscreen - Seriously THE BEST stick sunscreen there is. I love, love, love it and so do my kids. It goes on easy, makes application on their faces a breeze and most important to them, it goes on clean. No white sticky mess to have to try to rub in! I love the size, too, and keep these stashed all over the place...in my car, in our baseball bag, in my daughter's soccer bag, etc. 4. Coconut Oil - I once read that using coconut oil was not only a good moisturizer, but something good to use to take off eye makeup and now it is all I use. I keep a jar in my bathroom and put a little on a washcloth to wipe make up off of my face and then I put some on the end of a q-tip to get my hard to wash off eye make up off. It works SO well. I also use this to get my son's baseball eyeblack off. It's the only thing that takes it right off without having to scrub. 5. EVER Daylight Tinted Moisturizer - I use this as a foundation in the summer. I love it because it is sheer with just a little coverage, light weight and it has an SPF built in. It also smells amazing!!! It comes in several colors so you can match your skin tone and I use color Light. 6. Beautycounter Tint Skin - This is the foundation year round when I'm not using the EVER mentioned above. I wear color Linen. It is also pretty sheer and not to heavy, which is what I like about it. 7. Beautycounter Lipgloss - I love the Beauty Counter Lipgloss because it stays on, but doesn't feel too gloopy. Carrie Beth and I love so many of the same products. I've learned that of all make-up brands Beautycounter is also my favorite. Everything I've tried, I've loved. The eyeshadows and the lip glosses topping the list. But the following are my must-haves. Like the ones I couldn't live without if I was stuck on an island. All of the following products I just love! I use a rotation of them throughout the week and most daily. 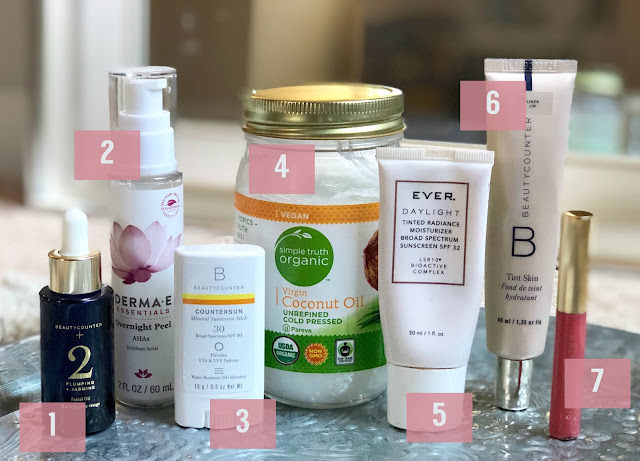 I tend to have dryer skin (especially in the cooler months), and each of these pack a hydrating punch while at the same time doing a seriously awesome job of keeping wrinkles at bay. We shared our favorite Fall and Winter lip colors, but these two are my favorite to use in the Spring and Summer. I also love love love the color Rosy Pink from the Color Intense line, but I need to order some more after a certain toddler got a hold of it. A few weeks ago Carrie Beth passed this Eye Cream along to me. I've only used it a couple of times so I can't give a full review, but so far seems to be doing a great job of making my tired eyes a little brighter. I'm still on the hunt for a great deodorant and a mascara. Mascara seems to be the toughest. I tried the Beautycounter volume one and didn't love it. Please share if you've found an awesome one that I can try! Have you made the switch to cleaner beauty products? What are some of your favorites?